Irrespective of our free will, life (the Universe) presents some challenging pre-programmed experiences or events that will manifest this lifetime and which are indicated in our natal charts. Our natal charts actually reflect our pre-birth contract or agreement in many ways. 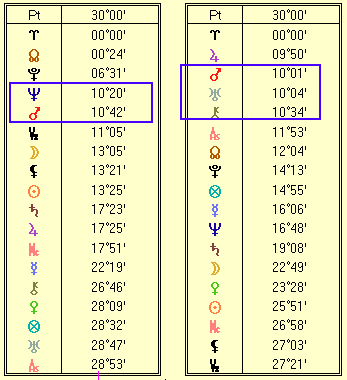 In relationships, some (pre-programmed) events or experiences are likely to manifest (for good or ill) when certain sensitive degrees in synastry (the chart comparison between two people) are hit by transits or progressions. The current relationship issues between Angelina Jolie and Brad Pitt prove again that a highly simple method (no calculations needed!) that highlights such events or experiences is almost infallible. More about this in the featured article below. In a recent Blog post, NASA confused the world by posting incomplete information about the zodiac signs. They misled the majority of people who are unknowledgeable about real astrology by omitting vital and critical information. What NASA (which stands for Never A Straight Answer -- LOL) doesn't (want you to) know: there is an important distinction to be made between the 12 astrological signs of the (tropical) zodiac and the 13 astronomical constellations of the (sidereal) zodiac! This article explains it all nicely. Moreover, the 12 astrological zodiac signs are as 'scientific' as the 13 astronomical Constellations because the 12 zodiac signs are based upon the declination of the Sun. The annual path of the Sun turning in a band of up to 23-24° above and below the equator defines the 12 (tropical) zodiac signs. The highest declinations North and South as well as the Sun's passing across the zero line (the equator) are related to the equinox and solstice points (which mark the start of our 4 seasons)! In the (tropical) zodiac, these also correspond to the beginning of the Cardinal signs (Aries, Cancer, Libra and Capricorn). These four cardinal zodiac points also equal the four elements (Aries = fire, Cancer = water, Libra = air and Capricorn = earth). Each of the four elements manifests in three modalities (the Trinity or Universal Law of Three): Cardinal (initiating), Fixed (consolidating) and Mutable (spreading), hence building 12 'fixed' principles that are translated into the 12 'fixed' zodiac signs. In Western astrology, the four elements and three modalities thus describe the 12 (tropical) zodiac signs. In general and on a mundane level, events are likely to happen around November 4, November 11, November 17 and/or November 24. Make sure you take a break often to free yourself from all the tension. You try to restlessly cope with any situation you are in. Also beware of brushes with the law. This can be a successful month overall. If you are born around January 15, February 28, April 14, May 30, July 16, September 1, October 17 or December 1, the influences will likely affect you most. If you are born around February 4, March 20, May 5, June 21, August 7, September 22-23, November 7 or December 21-22, the configurations may affect you in particular. This will especially apply to you if you are born around January 17-18, March 2, April 16, June 2, July 19, September 4, October 20 or December 3. There is the potential of ill health and/or very hard work. If you are born around January 20, March 5, April 19-20, June 5, July 22, September 7, October 23 or December 6, the configurations may affect you in particular. Don't resist the current transformative energies and get over the tension because you are able to find and go your own way. It's a good time for home improvements, enjoy your home as a cozy place and be creative. This especially applies to you if natal Saturn and/or Neptune do not interfere and if you are born around January 6, February 4-5, March 5, April 4-5, May 5, June 5-6, July 6-7, August 7-8, September 7, October 8, November 7 or December 7. Around November 24-25, Jupiter at 15° Libra squares Pluto at 15° Capricorn while Venus also conjuncts Pluto indicating the focus is on buildings and real estate. So yes, these birthdays are in for a couple of very auspicious days. We updated the pages about the (love) life of Angelina Jolie and Brad Pitt with the information about their (unsurprising) divorce. We updated our one way love page with the additional information that we discussed in our previous Love Letter. We added new pages about the signification of the Sun sign Aries combined with all the 12 possible Ascendants and the Sun sign Taurus combined with all the 12 possible Ascendants. These are the 1st new pages out of 12; the next zodiac signs and Ascendant combinations will follow as soon as we are able to write the pages. If they have the same 'auspicious spot or area', things may go exceptionally well. Take a look first at the 30° dial or list of Angelina Jolie (see the table left on the image below). Now take a look at the 30° dial or list of Brad Pitt (see the table right on the image above).